The water tank was originally constructed of copper on the first Model 735 Stanleys but that was changed to the less expensive galvanized steel before too many had been manufactured. While copper tanks didn’t rust, that was not to be true for a galvanized tank; steam cylinder oil coatings not withstanding. As leaks developed over the years a various assortment of sheet metal and wood screws had been attached to fix the leak; some with washers. 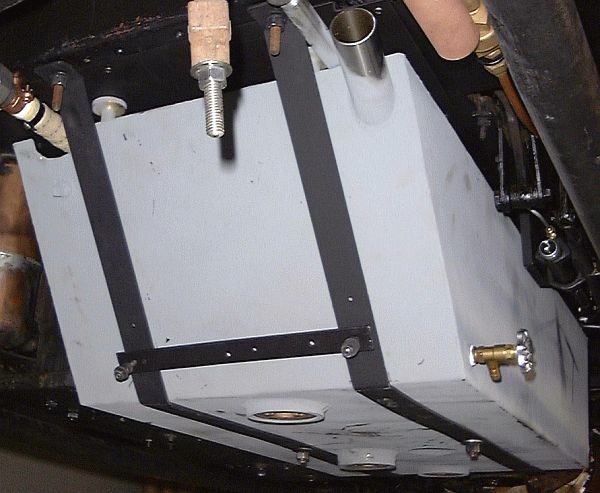 In addition, part of the mounting of the tank involves two pipes mounted vertically inside the tank with long bolts to hold the tank in place running inside each pipe. These had also leaked and been repaired with epoxy and other materials. The water tank is mounted under the center of the car alongside the pump box. This trapezoidal tank has a quantity indicator projecting up through the floorboard just in front of the driver’s seat. An overflow standpipe inside the tank prevents it from being over-filled. At the front of the tank is a pipe where condensate from the condenser may be returned to the water tank for reuse. And the water tank includes a half-inch line for the steam siphon to fill the tank (the tank can also be filled by removing the condenser cap and filling with a garden hose). The photo above shows the front left corner of the water tank where the condensate line from the bottom of the condenser enters the top of the tank. 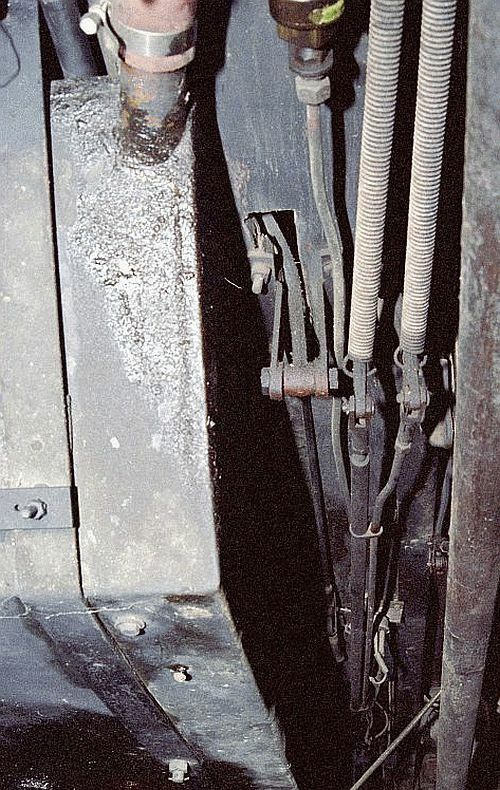 Two screws plugging leaks are clearly shown in the bottom of the tank alongside one of the steel straps which hold the tank to the frame of the car. To the right of the tank in the photograph above is the foot brake rod (left) and the dual rods of the hook-up pedal (right with springs). Steam cylinder oil injected into the steam on the way to the engine finds its way to the water tank as part of the condensing process of the exhaust steam. 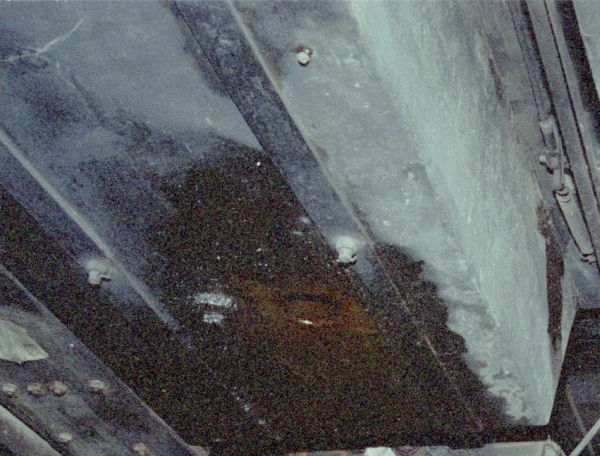 Thus the inside of the water tank becomes coated with oil that over time picks up minerals, dirt, and debris. After years of continued use the tank becomes coated with a buildup of material that is nearly impossible to remove as the tank can not be opened for chemical and steam cleaning of the interior. Steam oil as well as rust can be seen in the photograph above around the water tank's internal stand-pipe which serves as an overflow for the tank. A replacement galvanized steel tank was fabricated to exactly duplicate the original tank in size and shape. Two changes were made to the design as part of the new tank’s fabrication. Instead of a single 2-inch diameter clean-out plug in the bottom of the tank there would now be three 3-inch clean-outs. The added clean-out ports would facilitate more frequent cleanings of the tank and hopefully extend its life. The clean-out ports were also made larger so that oil absorbing “pigs” could be inserted in the tank to pick up any oil residue that found its way past the steam cylinder oil separator. Thru the use of a steam cylinder oil separator as well as oil absorbent pigs in the water supply tank the amount of oil being returned to the boiler would be minimized. The other change made to the tank was the addition of a small water valve at the front left corner of the tank. When operating a Stanley there always seems to be the need to take some part of the burner apart for cleaning or other maintenance on the road. There’s never any water for cooling a part so a water valve on the water tank will provide an available source. Additionally a Stanley invariably will require “side of the road” attention and cleaning steam oil from one’s hands with hand cream is made easier with a little bit of available water. The fact that the tank’s water will be warm from the condensation process only makes it more useful.